Butler’s Kamar Baldwin against DePaul last season. Big East conference plays begins on Dec. 29. Jimmy Lafakis/Collegian file photo. Through the beginning of the season, teams in the Big East have experienced the full range of emotions. Some have reached euphoric highs while other teams were disappointed just a few games in. With so many new faces in the league looking to find their role in the young season, let’s take a step back and see where the teams stack up before conference play begins. While DePaul has gained some ground in the Big East with its play this year, the Blue Demons still find themselves in the cellar. They have a solid win over Penn State in the Gavitt Tipoff but that’s the only notable victory on their resume so far. They have some close losses to Power 5 teams in Northwestern and Boston College, but there are no moral victories in the Big East. A 25-point loss to Notre Dame proves that this team is not quite ready to compete in the league but might be closer than you think. There was a lot of positive talk for this Hoya squad with Jessie Govan coming back and YouTube sensation Mac McClung entering the mix. Although McClung’s had his moments (38 points against Little Rock), he has been very inefficient — 38 percent from the field, 24 percent from three. Like DePaul, they have one quality win on their resume so far with a win at Illinois. They also have a few close, impressive losses headlined by the defeat at the Carrier Dome to Syracuse in the closing seconds. Georgetown has the upside to be scary, but the NCAA Tournament is a long shot. It’s no secret that Xavier lost a lot from its squad that was the fourth-overall seed heading into the NCAA Tournament last season. All eyes were on Travis Steele to see how this rebuilding year was going to shake out for the Musketeers. Through non-conference play, Xavier has the most losses of any team in the Big East. They ran into a buzzsaw in Wisconsin at the Gavitt Tipoff and surrendered two losses in Maui. Double-digit defeats at Cincinnati and Missouri bring their record against Power 5 teams to 1-4 before Big East play kicks off. Coming off a close loss to Villanova in the Big East championship game, Ed Cooley and the Providence Friars were looking to continue that momentum into the 2018-19 season. The team has delivered some impressive wins at Boston College and at Texas, but have equally confusing losses to UMass and a down Wichita State team. That inconsistency is to be expected with only one impact senior on the team. Their ability to win on the road will come in handy come league play, but there are no days off in the Big East, which the Friars will learn the hard way. Seton Hall was one of toughest teams to rank on this list. They own some of the best wins of any team in the Big East but have some kinks in their armor just the same. The Pirates rely on the shoulders of Myles Powell, which can be great if he plays like he did against Kentucky in Madison Square Garden, and be bad if he is inefficient like he was in their loss to Saint Louis. Their recent five-game winning streak is something to look out for, though, as the Pirates are hot heading into league play. Yes, St. John’s has yet to lose a game this year, but it is important to take a look at its schedule. The Red Storm’s win at Rutgers is looking better as time goes on, but outside of some neutral court wins against low-major and mediocre mid-major teams, there isn’t much meat on the bone here. Shamorie Ponds is playing like an All-American through the beginning part of the season, but Red Storm fans will be curious to see how the team plays against the everyday grind of the Big East season. Evident by their pre-season rank, the Creighton Bluejays have been the surprise of the Big East so far. In contrast to St. John’s, Creighton has really tested themselves in their non-conference schedule. Their losses: at home to Ohio State and Gonzaga, and on the road to Nebraska and Oklahoma. Barring a collapse, it is safe to say that all four of those teams will make the Big Dance. Throw in a win over then-ranked Clemson and the fact they were leading for the majority of the Gonzaga game, and this team has proved that they can play. 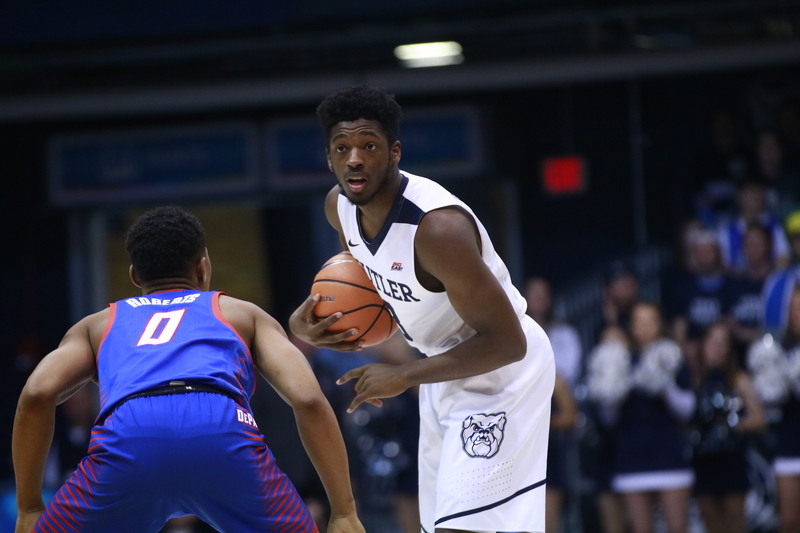 As the keys to the proverbial car were handed to Kamar Baldwin this year, expectations were mixed for Butler. And so far, they’ve been exactly that: a mixed bag. The offense has been shaky in losses to Dayton and Saint Louis, yet looked fine in wins over Ole Miss at home and Florida in the Bahamas. However, the debut of Jordan Tucker has rejuvenated the hopes of the Butler faithful that expect the Bulldogs to compete in the Big East this year. If the offense is clicking, Butler will be a dangerous team come March. To say that Villanova has breezed through the season en route to defending its national title could not be further from the truth. The Wildcats dropped out of the rankings after their loss to Furman before returning after a nice win over Florida State. But then, they fell to Penn and an upset win at Kansas was not in the works and they stand at the beginning of conference play as an unranked team. At this point last year, they had not yet lost a game. Don’t get it twisted, this team is still the most dangerous in the conference, but it will not be easy for the Cats. Marquette has put the league’s best offense on display with the most impressive non-conference run of any team in the conference. The neutral court win over Louisville is looking better day-by-day, and the wins over Kansas State, Wisconsin, and Buffalo are proof that Coach Woj and the gang are no joke. The only concern is that those wins may have been slanted in Marquette’s favor by way of its immense home court advantage. The Golden Eagles will have to win games on the road in the Big East in order to win their first Big East conference championship.